Our brand new Fundraising event will be held on Thursday 19th October at The Isla Gladstone Conservatory in Stanley Park. 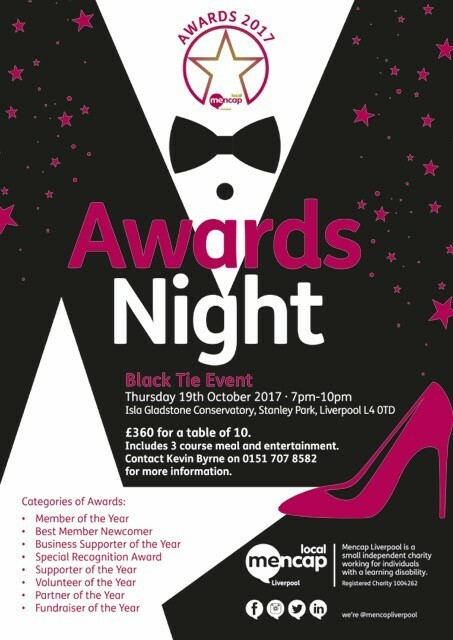 Our first ever Mencap Liverpool Awards Night will showcase our brilliant members, volunteers and befrienders as well as thanking our corporate supporters from the last year. Tickets cost £40 each or £350 for a table of 10 which includes a 3 course evening meal, a welcome drink on arrival and an evening of great entertainment from our members and corporate supporters. We also have a number of sponsorship packages available, including sponsoring of our awards and the night as a whole. To book your tickets- to talk about sponsorship opportunities, or to find out more information, please contact Kevin Byrne on 0151 707 8582.